Worst Case Scenario: Outnumbered Assault! We’re bound to be outnumbered sometimes. That is unless the MILSIM scenario planners intentionally set the opposing forces at exactly an equal number of troops – and that almost never happens! The natural instinct under such conditions is to bunker-down tight and form the team into a small defensive perimeter. And who’s kidding whom? That makes perfect sense. After all, the defense is stronger than the offense, and we are told to use the defense as long as it takes to form into an effective offensive force. Here we’re presented with a paradoxical statement. While the defense is the logical conclusion to being significantly outnumbered on the battlefield, the defense is rarely used with positive effect. How can that be true, is MILSIM plagued with ineffective leadership? Not necessarily. The defense requires significant resources of time. Energy is spent developing and coordinating fortifications from which to repel the attack. In MILSIM, and indeed on actual battlefields, these resources and energy are scarce! A viable alternative to frantically working toward an effective defense is to mount an effective offense. 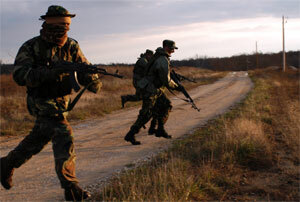 There are numerous types of offensive tactics: deliberate attack, movement to contact, pursuit, and exploitation. Each offensive tactic is employed in different situations against specific targets. The deliberate attack is employed for situations in which the enemy’s disposition in known. That is, the attacking force knows where the enemy is, what their strengths and capabilities are, and what obstacles lay in front of the enemy position. Remember that the defending enemy force must cover down its resources over the entire front of the terrain they wish to defend. Ironically, this means that the larger enemy force is vulnerable to attacks by a smaller force IF the attacking force has cleverly chosen a time and place that allows the attackers to outnumber and overwhelm the local defenses along their point of attack. The key element for the deliberate attack is that the smaller assaulting force only has to outnumber the enemy at the local point of the engagement! This is true for all forms of offensive tactic. Likewise, the movement to contact (MTC) merely needs to identify those enemy targets that it can outnumber and overwhelm. Remember the MTC is used when the attacking force has little information regarding the enemy disposition. Still, the conclusion that only a superior force can conduct a MTC is patently wrong (though admittedly ideal). Smaller forces can conduct MTC. In such case, the forward vanguard teams are instructed to identify enemy targets that can effectively be destroyed by the reserve force. The offense must employ either stealth or mobility to remain elusive. Otherwise, the larger enemy force will press a decisive engagement and use their superior numbers to defeat the MTC. The key element for the MTC is that the smaller assaulting force must maintain elusiveness. Elusiveness helps achieve the element of surprise. And again, the element of surprise is key to any offensive action. The pursuit is a transitional offensive tactic. That is, the pursuit is used to maintain momentum after a successful attack when the enemy is on the run. The pursuit has the expressed goal of destroying or capturing an enemy force. The mistake that is often made is the assumption that the pursuit must destroy or capture the escaping enemy ENTIRELY. This is all but impossible, particularly so when the enemy significantly outnumbers the attacking force. Instead, the pursuit must quickly identify the target exactly. That might be the enemy’s command element, or it might be critical weapon teams such as the mortar section, rocket section, or marksmen teams. The key element for the pursuit is that the smaller assaulting force must immediately identify targets for the enveloping team. The enveloping team bounds rapidly forward of the main pursuit and attempts to fix the assigned target in its escape route. The main pursuit must bypass any and all enemy pockets of resistance and maneuver quickly to destroy the identified target! Exploitation is also a transitional offensive tactic. The exploitation is used to seize critical terrain or facilities after a successful attack. Again, a common mistake is that the successful attack force will attempt to exploit every enemy resource simultaneously. This is a difficult task when the attacking force outnumbers the enemy. It is futile for an attacking force that is significantly fewer in number than the enemy! Instead, the commander must have an idea of what lies beyond the initial engagement area. With this knowledge, the commander can communicate his intended target to the troops once the initial offense has achieved success. And again, the exploitation bypasses all other enemy pockets of resistance while maneuvering to the target. The key element for the exploitation is that the smaller assaulting force must be informed of the critical (secondary) target to exploit. Without this information, tactical success will stall. The victory is for nothing. Remember that troops must ALWAYS have an objective! A tactical victory that is not followed upon with an operational victory is a useless expenditure of resources. Let’s be clear on this. When significantly outnumbered by an enemy force, the optimal solution is to have a prepared defense into which our force might fall back. 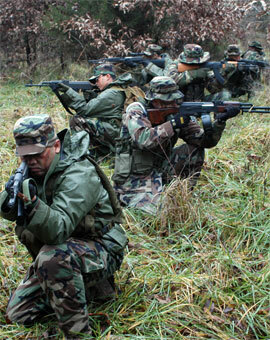 From this stronger position, the defending force seeks the opportunity to conduct a counterattack. However, the defense requires time and energy. Often the case is that a series of quickly, carefully placed counter-strikes will produce the desired effect of defeating the larger attacking enemy force. Key to a successful assault by an outnumbered team is that (1) the troops are informed of the commander’s intent, (2) specific objectives are identified, (3) elusiveness is employed to achieve surprise, and (4) the offense needs only to outnumber the enemy at the local point of engagement.